Top-seal thickness. Several studies define the confining unit above the lower Potomac aquifer (Trapp, 1992; Trapp and Meisler, 1992). It is generally composed of "tough" or "hard" clay and sandy clay beds. 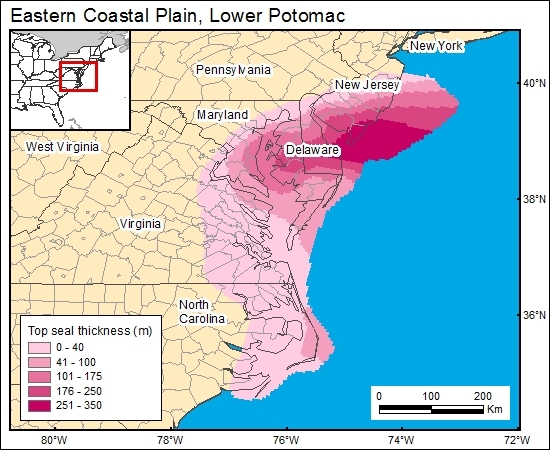 It is regionally continuous from North Carolina to New Jersey and generally ranges in thickness from 50 to 100 ft but exceeds 1,000 ft toward the mouth of Delaware Bay (Trapp, 1992). Trapp (1992) provided a map showing the thickness distribution of the lower Potomac confining unit across the area of interest, and this map is gridded for the GIS (c7potomacg).